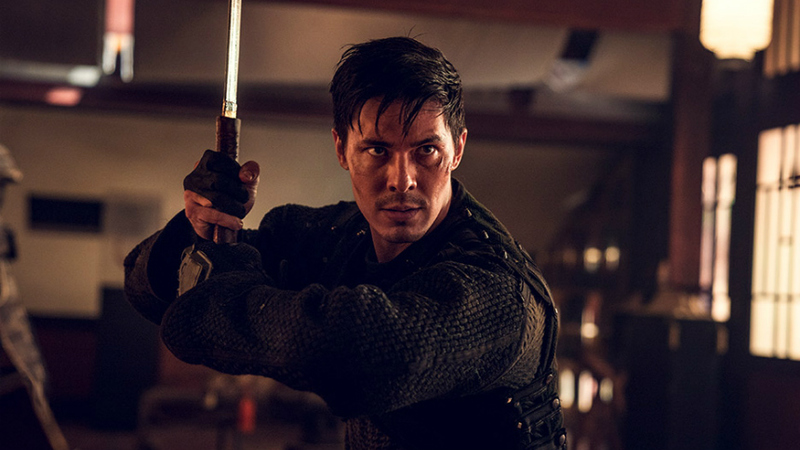 One of the most exciting rising actors today is Lewis Tan, who recently played the character of Zhou Cheng in Marvel's Iron Fist, had various roles in films & TV shows such as Den of Thieves, Rush Hour, Hawaii Five-0, NCIS: Los Angeles, CSI: Miami, and is now featured as the character of Gaius Chau in the hit AMC series Into The Badlands, which had its Season 3 premiere last Sunday. Also, as a recent trailer revealed, Lewis will be playing Shatterstar in the upcoming and much-anticipated sequel Deadpool 2. I got the chance to chat with Tan on his current work on Into The Badlands and Deadpool 2, his potential future projects, his top three Marvel films, his thoughts on whether there will ever be an Asian American version of Black Panther (and his thoughts on the upcoming live-action Mulan and Crazy Rich Asians), and his views on how Asian Americans are currently represented in media. Timothy Tau: How's everything going man? I can imagine - so you're out in Dublin right? I'm in Dublin man, freezing cold Dublin. (Laughs). And not to mention a 16 hour difference. Yeah it's that, everything's different out here. It's cold here, it's raining, it's snowing. We recently had the worst winter in the last decade here or something like that. We were snowed in. I was in the hotel and they ran out of food in the hotel. They ran out of everything, it was crazy. Wow. It sounds like THE REVENANT or something. Oh yeah, I was talking to Daniel [Wu] the other day and he said you guys are pretty much shooting the last episode? That's it. We're on the last stretch. Awesome. Daniel was also mentioning how this season was pretty crazy in that you guys have like 16 episodes or something? Yup. 16 episodes. I hear that they are going to be doing a mid-season break. So they're going to do eight and eight, what I heard. Don't know if that's been confirmed, but that's what I heard. But yeah, 16 episodes. It has been a grueling experience, but man - you know what, we put in so much work into this damn thing, I think it really is going to be or represent the next level, it's going to be the new standard and raise the bar, you know? The whole martial arts/action/drama genre - I'm thinking we might even scoop up an Emmy this year. We didn't even submit the year before so I think we're looking at scooping up an Emmy this year. Absolutely, man, hope it happens. So your role is Gaius Chau, the brother of Baron Chau (played by Eleanor Matsuura). How did everything get started in terms of your involvement with INTO THE BADLANDS? Yeah, like after the attention of things like Iron Fist, and him seeing some of my other work, LaToya Morgan (one of Into The Badlands writers and producers, also known for her writing work on Shameless, Parenthood, Complications and TURN: Washington's Spies) brought it up in a room, in the writer's room, and was like "look Al, you need to take a look at Lewis Tan, he's perfect for this," and Al took a look at my work, and he wrote me on Twitter and was like: "Hey, I'm a fan, and we might have something for you - and would you be interested?" And I said of course, I'd love to work with some of the legends like Master Didi and Andy Cheng and Stephen Fung and Daniel Wu, and I was very enthusiastic about the opportunity, but I also had other things going at the same time, so it was kind of a timing thing, to see what job was going to work out, and by three months later, Al says: "OK, we've got a part for you - we wrote something for you - could you put in on tape?" I put it on tape, and the rest is history. That sounds like the perfect origin story for your character. A really intensive training session, which I didn't get to do - but thankfully I train all the time anyway. I'm in the gym training with different masters and different styles of martial arts, six times a week, and I don't stop, so it was kind of one of those things where you prepare because you know something's going to happen in the future, so I was ready already, and therefore it was nice to get here and kind of be in the zone and get to show not just my acting skills but my martial arts skills as well, you know? Definitely. Did you train in any new martial arts styles? Or was it pretty much similar to what you used to train in for other projects? Well our trainer, who Daniel brought in, whose name was Matt Lucas, and he trains in many different styles. So we don't really train for a specific style. And as I'm sure you've heard before, we don't really rehearse a lot or do a lot of pre-choreography. Once they have the choreography down, we have ten minutes to learn it. But what's good about it is that the training keeps you ready for anything. And when you shoot, you kind of have a freestyle, improvised, feel to it - and it looks more realistic - and not something that has been over-rehearsed again and again and again. And what I think stands out about Badlands to me is - coming from an action background and with my father [actor and stuntman Philip Tan] and being on movie sets since I was two years old - is one thing that they have is the final cut to the action sequences, so the action team has direct access to it. I think a lot of studios mess up the sequences in the editing room, whereas for Into The Badlands, the producers trust the team to cut their own work, and it makes all the difference in the world. So I think that is really something that makes these sequences stand out. I mean it's something that would take days and weeks to rehearse the types of sequences that we do. They are truly mindblowing and I think that they are the best on television. I think that they compete with most films - most martial arts films - even better than most martial arts films nowadays. So it's an honor to work with them. Definitely sounds like more of an organic or improvisational process. And Daniel was saying that sometimes you guys throw in some like Jackie-Chan esque fight scenes with props and stuff, but it seems like the team creates a fight scene based on the circumstances of a scene and go from there. Yeah, we have some amazing locations out here in Ireland. That's the reason why they came here. And when we get on set, we have two units shooting all the time - a drama unit, and a fight unit. And they both have directors, both have crews, both have everything, so - there's two units simultaneously shooting always, and whether or not if you're on drama or on the fight unit, you go to the fight unit set, and I might have already been there and shot some drama scenes, but you go to a fight unit set, and the next thing you know, they're jumping off cars and smashing everything in sight - so it's a very creative process, they like to take things that are there and use them. Obviously Jackie Chan paved the way when it comes to using props, and things on set, feeding them into the martial arts choreography - they [the Badlands action team] do a lot of that, but it has to fit the story. They don't really shoot for - although it's incredible - the "shock value," they shoot for the story. And I think that's really important because the martial arts to me is a character in Into The Badlands. The action sequences have to tell a story. Or else it's just shocking and beautiful. But it's not moving. It should be moving. It should be a form of expression. And they are very good at doing that. For sure. Can you give us a potential preview of actors/characters that your character Gaius Chau fights with? I have a pretty awesome fight with - you can sort of get a feel of it in the trailer - but I have a pretty awesome fight with Dean Charles Chapman from Game of Thrones (who plays Martyn Lannister on Game of Thrones and a character named Castor on Into The Badlands). I think he's one of the first I end up fighting. And Dean's character, as you can see from the trailer, has the "Dark Chi" power, and so it's a pretty brutal fight between him and I because my character does not have that power (laughs). And he (Gaius Chau) just got out of jail, so he's not in the best form. Dean actually comes from a dancing background, and he picked up the choreography incredibly well. And he did almost all of his action stuff - with me, anyway, when him and I fight - so when you see us fight, you know, its just him and I only, and he was a great fighting partner to work with because he has such good rhythm and timing. And I'm a fighter - I used to fight competitively before I did film choreography and film fights - so its different for me because I have to learn how to pull punches and learn how to hold my body stance differently for camera - whereas Dean is a dancer and he can pick up the rhythm and pick up the choreography very quickly, and he did a great job. So Dean and I have an INSANE fight scene in the show. Right on, looking forward to it. So you don't do any Drunken Fist Kung Fu like you did as Zhou Cheng in IRON FIST? No, ha, Gaius doesn't do Drunken Kung Fu - he fights more with a very aggressive style, using a single katana. His style is more kung-fu based, but there are a lot of power moves, there are a lot of traditional katana sword moves, mixed with a little more of a modern twist, but it's very realistic, you know? The way he fights is very powerful and aggressive. And I think it's cool to adapt my own body size and my own personal style to the martial arts of the character - I try to do that with every role. As I did with Iron Fist [Lewis also played a boxer named Luke Nakano on an episode of Hawaii Five-0 in 2015] and you'll see it a lot here as well. And a lot of it is I put my own action on the role, my own colors on it. Certainly. Can you tell us a little more about who Gaius Chau is as a character? And maybe the role he plays in the saga of Season 3? You're going to see a lot of the Chau family back story, which I think is very interesting. You don't see a lot of that in Seasons 1 or 2, so you're going to go back into their childhood, and Gaius is connected with a lot of the other characters, even through his childhood. But you'll see how he was raised, he was raised in a very abusive household, a very tyrannical household; and like they said before in the Season 3 announcement materials, he is the brother of Baron Chau, and he has been basically put in jail for setting Cogs free. So he's kind of like a freedom fighter in a way, and is kind of the Black Sheep of the family. The Rebel of the family. And they've locked him in a prison for years. So he's been living in this beautiful mansion, but in the basement, in this prison they've created for him. And basically his sister, Baron Chau, comes to him with a mission, in order to pay for his freedom. So that's how he gets out of jail and joins the story of the Badlands. And a lot of things will connect from his past once he gets out. Gotcha. And it's at a time when all these different clans - well, the two main ones led by the Widow and Baron Chau respectively - are at war with one another? That's right, it's just the Chau family and the clan led by The Widow and all of her people, and now there's a much more powerful villain that Babou Ceesay plays called "Pilgrim." And he's basically putting together a cult of some kind, and conjuring up a lot of power, and he's a force to be reckoned with. So you'll see how all of that plays out, which will be cool. Right. Do you have any fight scenes with Nick Frost? (Laughs). I had scenes with Nick Frost. Nick's a great guy. We were just shooting together yesterday. He's HILARIOUS. It's hard to act around him because he's so funny. I've never been the one to break character on-screen or anything, but he's almost had me [do it] a few times. He's almost had everybody a few times. He's hilarious, he's always improvising lines, doing his own thing - I wish they could do an outtakes reel and just follow Nick around and get all of his improv because it's gold, all of it's gold - he's hilarious. Does he do a lot of his own fight scenes? Because from a lot of the scenes from Season 2, he looks like a really amazing fighter. Yeah I mean Nick can move! Definitely, man. He's got a great stunt double, Brian Lee, who stunt doubles him but Nick can move, and he loves to get involved, so he loves to get his hands dirty, so you know, that's the thing - all of our cast is SO committed, I've never seen it before. To this level. I don't know if it's because we're all here in Ireland together, or we're fighting the cold, and it's eight months and it's a grueling process, we're all injured, we're all tired - but everybody is so committed, and everybody tries their best to do as much of the fight stuff as they can. And I think it's crucial when doing an action scene of a film or an action series. A large part of telling the story is in the expression of movement and the storytelling that the action has. And I think a lot of the people forget about that, and it's a shame because it's a disservice to the story and also to the character. But a lot of the cast in Into The Badlands are so committed and that's a really beautiful thing to see and I think you can see that on screen as well. Definitely, definitely. Switching gears, can we talk about other projects that are on the horizon or coming out soon for you? Namely, you'll be starring as Shatterstar in DEADPOOL 2. Can you talk about that to the extent you are allowed to? All I can say is that Marvel fans are the best fans in the world and they have the best eyesight of any fan base (both laugh). Well yeah, once I think the trailer dropped, you could see Terry Crews (Bedlam) and I, and Bill Skarsgård, Zazie Beetz (Domino), Rob Delaney (Peter), and it blew the Internet up, so the secret is out for sure, but I know that they are going to be dropping more information about that soon, so I can't say too much - but I'm really excited to be a part of that because Deadpool already is one of the best Marvel films of all time. One of my personal top three of all time. And that's interesting because that's not your first project with the Marvel Universe. You were also Zhou Cheng in IRON FIST. And I found it interesting that the character of Shatterstar is not an Asian character, but sometimes they do that with roles where the race is not really specified. So they can go with an Asian American actor. I found that interesting versus that whole IRON FIST casting controversy with Finn Jones, even though Iron Fist/Danny Rand was always white in the comics. What are your thoughts on how maybe there was an opportunity that IRON FIST missed in casting an Asian American actor in the lead role? Or do you think it's a bit premature to think about something like that at this point? I think that, looking back on it now, I mean look - Danny Rand was a white character, so if you make him Asian American, you've now changed the story. Now could the story still work? Yeah, it could work. He could be an Asian American who was disconnected from his roots, and has to go back to Kunlun and kind of discover himself. But it would have been a different story. So I get where people are coming from when they say that. I think the backlash was more because we haven't had an opportunity for this yet, as Asian Americans, and people thought "Oh, this could be a good opportunity." So I think that's where it stems from - the timing of people wanting to see an Asian American to be the lead in a hero film, in a martial arts film/show, you know, something that is part of our culture, my culture. And I think that's where the backlash came from. But you know, Iron Fist or Danny Rand's character is white, so they cast a white actor, and I think that makes sense, you know what I mean? Do I want to see Asian American heroes? You know I do. Is it going to happen? Yes it is. Am I going to be a part of it? Of course. But the timing of it wasn't there for that particular show - and with regards to Shatterstar, he's from Mojoworld, he's an alien, he really doesn't have a specific race, he just has bright, orange hair in some of the comics, and he's a warrior, and a fighter from a different planet, so I think they could have passed with any ethnicity for that role, and I'm very grateful that they thought I'd be up for it. For sure. And you were mentioning this earlier, and there might have been some discussion about this on Twitter, but the BLACK PANTHER phenomenon breaking all these box office records, etc., and being a really amazing film with a nearly completely African American cast, and people are saying, "Oh when is the Asian American BLACK PANTHER going to be?" And sort of my take is that African American cinema and the history of African American cinema has had so much more in terms of their milestones, compared to Asian American cinema, that it would make sense for the Asian American BP to take more time to occur - but we may be able to warp/compress time and advance at a faster pace to close that gap with upcoming films like CRAZY RICH ASIANS, MULAN, etc. So I was just wondering what your views on those issues were? Yeah, Donnie Yen in MULAN - and that's exciting to see in Hollywood, more Asian representation, but that's almost intertwined with the big, looming and overwhelming influence of the Chinese movie industry, but at the same time there are Asian Americans - so I was wondering your thoughts on that dynamic, and maybe having something more genuinely Asian American vs. coming/financed straight from China? It's time for that to happen. I mean Black Panther, I LOVED that movie. I couldn't speak for a few days after I watched it (both laugh in agreement). It made me emotional, you know. It really made me emotional. Not just because of what it did, but because of the actual film itself - it was a fantastic film. So you know I think Black Panther has definitely broken down some doors for everybody. And so you've got to be respectful and grateful for that. And I think after that some people were like, hey, wouldn't it be great if Asian Americans had something like this? And I think some people kind of took it the wrong way and were saying "Where is the Asian American Black Panther" or there should be Asians in Wakanda, but I don't think that was what people were trying to say - I think what they meant was: where is our equivalent, we also want to be represented, we also want a milestone like that, of that caliber, where there are heroes, and the characters are so well thought out, and there are so many good character arcs, and it's just a beautiful, emotional roller coaster. It's coming. 100%. And I think they've tried to do the cross-overs from China before, and China's film market has blown up, so obviously there's money there, obviously there's fan bases there, there are people who want to support these films, it just takes a while for studios to catch on. But it is definitely coming. I mean, I've been approached by a few people for different projects that are trying to get off the ground that are going to help that movement. And like I said, there's a lot more that I want to do, just for me, but I also want to be a part of this movement that is happening for the Asian American community. And to be a leader in that movement, and I'll dedicate everything to it. So I feel very strongly about that and I feel very positive about what's coming in the future, for sure. And CRAZY RICH ASIANS, which some people are trying to compare to as our BLACK PANTHER? I have not seen the film so all I can say is this, Crazy Rich Asians represents a milestone, a romcom with an all Asian cast backed by a major Hollywood studio. This is just one of many as we break down this wall, we will have films in every genre, some will be good and some will be bad, the goal is to be equal. To share our stories and be part of others as a human, as an actor, as a character with depth, without addressing color. I don't like people comparing it to Black Panther (a film I loved and admire) it is not our Black Panther, it is Crazy Rich Asians, it has its own place and it is just the beginning. I was talking with Russell Wong the other day, and remembering about how groundbreaking VANISHING SON was in the 90s - four telefilms and one season of a TV show - the first thing on TV to feature a handsome, dashing, romantic Asian American male lead. And there was another show with Sammo Hung called MARTIAL LAW that lasted for two years, another show with Russell called BLACH SASH that had one season - and way back in the day when Bruce Lee tried to bring Kung Fu to TV, and early short-lived shows starring Pat Morita, etc. - and now in the modern era with shows like FRESH OFF THE BOAT, DR. KEN, INTO THE BADLANDS, etc. It feels like Asian Americans have made strides in these forms of media, but this progress really only came about recently, as in these recent few years or less. Do you feel as an actor that is active in both film and in TV, do you think the change is going to come faster for one medium versus the other? Or do you think its going to be a bigger impact that is going to effect everything regardless of whether it is TV, film, streaming media, etc? Oh really? Yeah we were even talking about trying to bring back VANISHING SON since everyone is doing 90s reboots nowadays and I was thinking you'd be a great candidate to play the Americanized son of VANISHING SON aka Jian-Wa Chang (the protagonist). For sure, shout out to Russell Wong. And the thing is with streaming media and Netflix and Hulu and Amazon, they are really platforms that have opened a lot up to new filmmakers because there is so much content that they need. So I think it's opened up a lot of opportunities for people to get noticed, and to get attention drawn towards them. It will probably happen in streaming services, and in television, before it happens in film, that's usually how it works. But I kind of see it happening all at once, in my opinion. Even now, there's a show - Into The Badlands - starring Daniel Wu, and myself - two Asian American leads - in one television show? On AMC, that's a hit television show? That's insane, right? And at the same time, I'm in this other movie Deadpool 2, and Daniel's in Tomb Raider - we're moving in all mediums. In my mind, it would all happen at the same time. And that's how I'd feel about it. My final question: can you talk about any projects that you are working on now or in the future that you are at liberty to disclose? Before I booked Badlands, I was in talks with producer Tucker Tooley, who did The Fighter, and Limitless, about a TV series starring myself, where I can kind of tell a story that is based off my father's childhood, and his upbringing in England, and how my father had a really rough childhood, and was abandoned and left on the street for many years, and ended up winning the National Title in Martial Arts (Tae Kwon Do) in the UK and ended up working with Tim Burton and Steven Spielberg, so he comes from a very interesting life that I wrote as a backstory to a kind of action-mystery. And we wrote the script for that and Tucker Tooley, a good friend of mine and an incredible producer, one of the best in the game, and he and I are developing it currently. So that's in the works, but it kind of got put on pause because I had to come to destroy Season 3 of Into The Badlands real quick (both laughing) and I've been here for eight months. It's turned into an eight month thing. And I'll be back in two weeks so we're about to go back into that. And I have some other interesting offers on the table that I can't say anything about yet because of agreements, and I don't want to get too excited yet but there are some big things happening behind the scenes. And I kind of like to keep my head down and work hard and when it gets released, let the cat out of the bag. I mean I was at Comic-Con last year, knowing that I was going to be in Deadpool 2, and people were asking me questions like what do you got up next and I had to say with a straight face "Nothing..." (laughing). So if I can handle that, I can handle keeping other secrets pretty well. But there's a lot of things happening in the pipeline coming. Definitely man. Really excited to see what's next for you and really inspirational to see you do your work. Definitely man. Like you were saying I really think it starts with the story, it's all about joining forces. And like you said, it's bound to happen (for Asian Americans), it's just a continual effort and will eventually happen one day but we just gotta keep pushing. Absolutely. I want to tell everybody to be vocal about it because the studios are listening, they're watching Twitter, they're watching Instagram, and they're listening, as you are seeing with Black Panther, Get Out, and these amazing films; we need to be vocal about it but at the same time we need to be creative and to be working really hard and learning our art, and that's it, and if we do all of those things, you're going to see a completely different future.